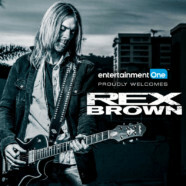 Multi-platinum selling artist Rex Brown has signed a worldwide deal with Entertainment One (eOne) with plans to release a debut solo LP later this year. “I’ve been working on these songs for a long time,” says Brown. The yet to be titled full length will be the first time in Brown’s career in which he will serve as both lead vocalist and guitarist in a band. Drums were tracked by Christopher Williams, himself no stranger to diverse tastes, from funk music to punk. His talent has been utilized by country music star Lee Greenwood, the reconstituted Blackfoot and most recently, power metal legends Accept. The album was produced by New Yorker turned Nashville transplant Caleb Sherman, a multi-instrumentalist with work on records by Little Big Town and Porter Block, among others. “Caleb produced the project from a musician’s standpoint,” adds Brown. “Not just a typical producer’s standpoint, which was something I definitely needed. Between Caleb and Lance, we were a force to be reckoned with. They really pulled out the best in me.” Peter Keyes, known for his work with Lynyrd Skynyrd can also be heard on a few tracks. All bass tracking came from Rex himself as well.